St. Mary's Orthodox Cathedral began in 1887 as an eastern-rite Catholic community founded by Carpatho-Rusyn immigrants, most of whom came from the villages of Becherov, Komlosa, Stebnik, Regetovka in an area north of Presov in eastern Slovakia (then a part of the Austro-Hungarian Empire). The community was officially received into the Orthodox Church on the feast of the Annunciation in 1891. Many faithful and dedicated clergy and lay leaders in the community have devoted themselves not only to the growth of the Cathedral congregation but have made a positive contribution to the life of the diocese and territorial Church. The community has generated many clergy and ministry vocations, a remarkable number of priest's wives, music directors and seminary teachers. Ecclesiastical politics has sometimes thrown its shadow over church affairs, but the community has persevered in building a stable parish life. Among some of the more widely well-known figures associated with St Mary's are: St Alexis Toth, St Sebastian (Dabovich), St Tikhon (Bellavin), Archbishop Anatole (Kamenskii), Metropolitan Leonty Turkevich, Bishop Benjamin (Basalyga), Dr Constance Tarasar. 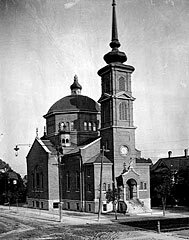 St. Tikhon Consecrated St. Mary's Cathedral in 1906. Through his efforts and Blessing, the first Russian Orthodox Theological Seminary was established in America in 1905 at St. Mary's. St ALEXIS was a true man of God who guided many Carpatho-Russian and Galician immigrants through the dark confusion of religious challenges in the New World and back to the unity of the Orthodox Church through his grace-filled words and by his holy example. His holy relics now rest at St. Tikhons Monastery in South Canaan, Pennsylvania where the faithful may come to venerate them and to entreat St ALEXIS' intercessions on their behalf. St. Alexis was our first pastor at St. Marys (1889-1893). He was instrumental in bringing our community at St. Marys into the Orthodox faith. 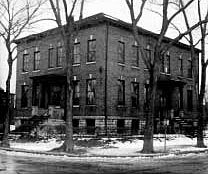 The picture to your left was the first school building which housed the seminary and mission school in the early part of the Twentieth Century. Today, our adult religious education sessions as well as our church school and youth programs continue to strengthen our church growth. 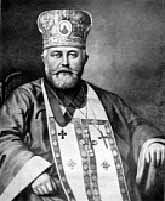 Metropolitan Leonty A former pastor (as Archpriest Leonid Turkevich) and rector of St. Marys parish and Seminary in 1907-1912. He became the Metropolitan of the soon-to-be Orthodox Church in America (OCA). Even though he died in 1965, his ministry as a pastor and Metropolitan was dedicated toward unifying the church and paved the way toward our autocephaly (Independence from the Russian Patriarchate) and establishment of the OCA church in 1970. Father Michael Illinsky Father Michael was one of the early priests attached to St. Marys and Inspector of the Minneapolis Orthodox Seminary in 1911. Following the death of his wife, Fr. Michael was tonsured a monk with the name Makary and consecrated as Bishop of Boston on October 13, 1935. He was appointed rector of St. Vladimirs Seminary in 1938. He became a Metropolitan in 1953. 1877 Arrival of the first Rusin immigrant, George Homzik, in Minneapolis. 1884 First Divine Liturgy served in Minneapolis by Fr. John Volianski. 1886 Committee set up to select property for new church. 1887 Construction of the first church dedicated to the Protection of the Most Holy Theotokos, and blessed by Fr. John Volianski in 1889. 1888 Arrival of the first resident pastor, Fr. Alexis G. Toth. 1891 Reception of Fr. Alexis Toth and the parishioners of St. Marys into the Orthodox Church from the Unia by Archbishop Vladimir. 1892 Establishment of the first Parish School at the direction of Archbishop Nicholas. 1893 Construction of a building for the Parish School, later Mission School and Seminary. 1894 Estabishment of the Mission School. 1904 Destruction of the original church by fire. 1905 Establishment of the Minneapolis Orthodox Seminary Construction of the present Cathedral structure. First English language Divine Liturgy. 1906 Consecration of the present Cathedral structure by Archbishop Tikhon. 1907 Assignment of Fr. Leonid Turkevich, later Metropolitan Leonty, as rector of the parish. Installation of icons from Trinity-St. Sergius Monastery, in Zagorsk, Imperial Russia. 1911 Construction of first Cemetery Chapel. 1912 Transfer of the Seminary to Tenafly, New Jersey, along with Fr. Leonid Turkevich. Fr. Vasily Vasilieff becomes pastor. 1921 Ordination of Fr. John Dzubay. 1932 Reintroduction of English Liturgy. 1934 Fr. Nedzelnitsky presented a mitre by Church for distinguished service. Gift of the youth of the parish. 1937 50th Anniversary Celebration presided over by Metropolitan Theophilus and Bishop Leonty of Chicago. 1940 Construction of present Cemetery Chapel, dedicated to the Annunciation of the Most Holy Theotokos. 1941 World War II. Establishment of Servicemens Committee. 1951 Assignment of Fr. Leonard Soroka as pastor, emphasis on youth. English now used regularly in Liturgy. 1951-52 Construction of two new parish homes (rectories). 1957 Construction of present school and parish center building. 1966 Construction of St. Andrews Chapel in the Cathedral basement begins. 1967 Bell Tower steeple snapped by wind on June 30th, quickly replaced. 1970 Autocephaly (Independence) of the Orthodox Church in America. 1971 Parish raised to a Cathedral status. 1975 Parish participated in program Viable Futures for Congregations. 1976 Death of rector, Fr. Karp Pateyuk. Establishment of Parish Library. 1982 Revised Julian Calendar adopted by entire OCA. 1987 Centennial Celebrations presided over by Metropolitan Theodosius and Bishop Boris. 1989 St. Tikhon, Patriarch of Russia, is canonized a Saint by the Russian Patriarchate. 1994 St. Alexis Toth is canonized as a Saint by the OCA church at St. Tikhons Seminary. 2005 Centennial recognition of Cathedral building. 2006 Centennial recognition of consecration of Cathedral building.